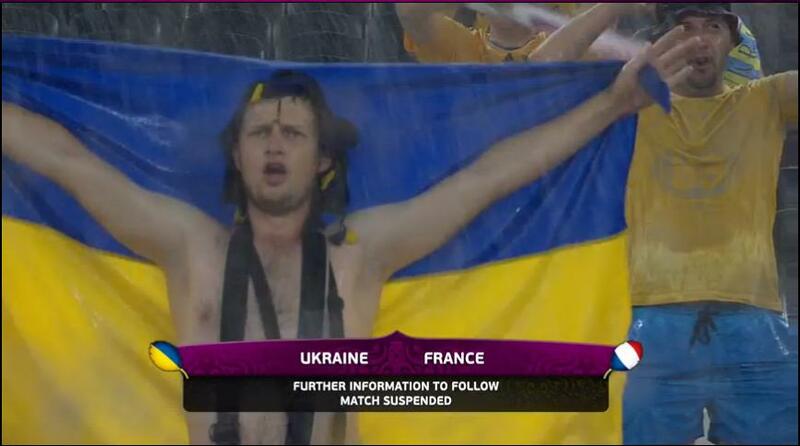 Lightning struck the Donbass Arena shortly into the match this evening. Soon afterwards the entire facility was engulfed in an early match deluge. The driving sheets of rain and dangerously close lightning strikes prompted referee Bjorn Kuipers to call a delay to the match after just four minutes of play. Despite the rain causing a delay in the match that did not deter the enthusiasm of the home crowd that came to support their national heroes. After the match official halted play for nearly an hour before the rain eventually subsided and the players returned to the pitch, resuming play. The first half hour after the restart was difficult for the aging Ukraine squad, who struggled to recover after the lengthy delay. Eventually the Ukranian squad settled into the game forcing French keeper Hugo Lloris to make saves on two scoring opportunities from Andriy Shevchenko. Despite France enjoying the majority of first half chances, the game nearly turned on its head when miscommunication between Gael Clichy and Lloris led to a chance for Andriy Yarmolenko, but the chance was wasted. Lightning would again strike twice in the second half, only this time coming off the left feet of Jeremy Menez and Yohan Cabaye. Menez' goal came when he collected the ball on the right flank, took a decisive cut inside, and finished between the legs of Yevgen Selin. It was a great break for the French set up by a Franck Ribery pass that allowed Menez to control the ball in space. Karim Benzema was also crucial in the buildup, leading the attack down the left flank before switching to Ribery. The French struck again three minutes later, set up from another brilliant ball by Karim Benzema. He found Yohan Cabaye with a ball that dissected the desperately defending Ukrainians before Cabaye turned and yanked a low left footed strike across his body into the goal. This impressive display was the first time France had scored two goals in a major competition since the 2006 World Cup against Spain. As the match dragged on and the rain continued to fall, the endurance of Ukraine failed them and their pace and enthusiasm could not be buoyed by their raucous supporters. In one run of play, France managed to string together twenty consecutive passes before Yohan Cabaye's effort struck the post. Ukraine simply lacked the magic they had during their opening match against Sweden, and will look to regain that magic and secure qualification next week against England. France now need only a draw to secure their spot in the quarterfinals.